The last few Autumn leaves have been falling for the season and days are getting cold here in the Scandinavian countries. I have been longing for more warm and comforting dishes as I primary eat a lot of fresh plantbased foods. I went to the farmers market and found a mix of fresh mushrooms for the pies as I thought it would add a variation to the flavor. combined with the caramelized onions and rosemary makes it a perfect savory meal to satiate both your senses and belly!! It’s a perfect treat for dinner on your own or even if you are having guests over for dinner, double up the recipe as you like. In a mixing bowl, combine the flour with a pinch of salt, then rub in the butter with your fingertips. You’ll get a mixture that looks like bread crumbs. To this, add some cold water, a tablespoon at a time, mixing and pressing the dough together with your hands as you do. You may not need all the water, just enough to form a smooth, pliable dough. Tip the pastry out onto a clean, floured surface and roll out with a rolling pin to a thin, even sheet. Press carefully into the tart dishes, trim, and refrigerate while you make the filling. Preheat the oven to 220°C. Heat up the coconut oil in a large saute pan. Over a medium-high heat saute the garlic and onion with the coconut sugar until golden and caramelized, stirring frequently. Add the capers and mushrooms and continue frying. Once the mushrooms are fully cooked, add the cream and the rosemary leaves (reserving a few to top the tarts), and cook for a further 5 minutes or so. Sprinkle in a tablespoon of flour and stir till thickened. Season to taste and stir again. Take off the heat and remove your tart cases from the refrigerator. Spoon the hot mushroom filling into the tart cases. Bake for 10 minutes, then another 20 minutes or so at 200°C, or until the tarts are caramelized on top. 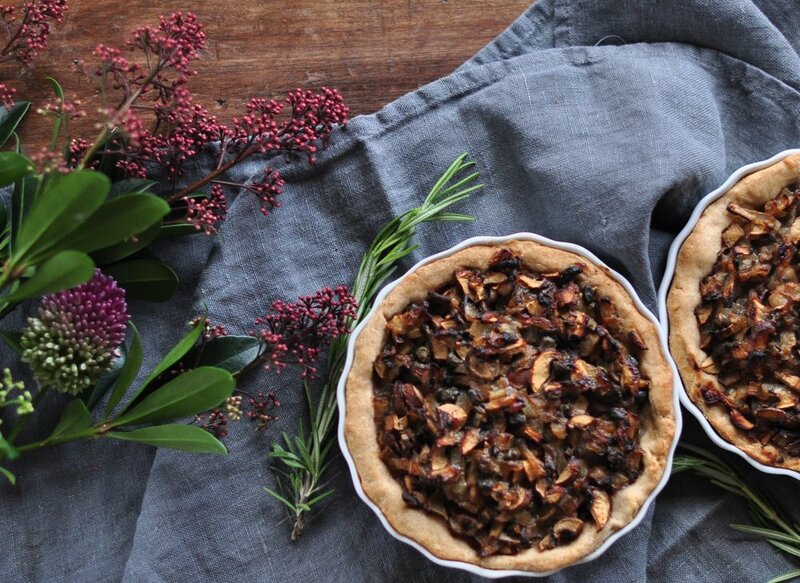 Top the tarts with more rosemary and serve hot or leave to cool and refrigerate.